Below are the results from a long running survey (49 polls) by YouGov, which asks the question, “In hindsight, do you think Britain was right or wrong to vote to leave the EU?“. Two things are fairly clear. First, that public opinion on this has been fairly firmly anchored near to 50:50 which reflects the split 52% Leave, 48% Remain of the 23 June 2016 ‘EU Referendum’ in the UK. That split ‘Britain’ almost down the middle, and the country remains split. Second, that there is a slight but clear tendency for later polls to err to saying that Brexit is a mistake – it was a wrong decision. I suggest the functioning of Track One and Track Two explain these results. 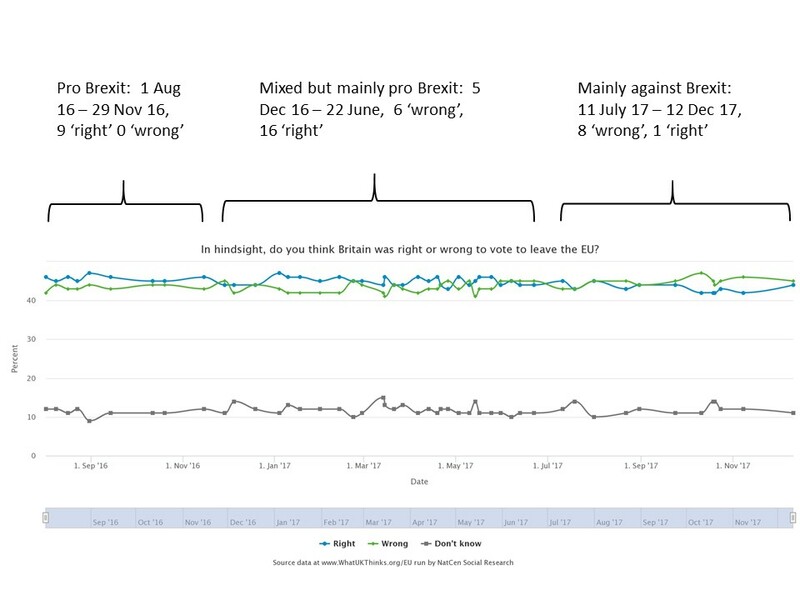 As you can see above (view the data in more detail at the YouGov website), ‘don’t knows’ fluctuate around 10% and from 1 August 2016 to 29 November 2016, every poll showed more agreement with ‘Leave’. The first dissent came on 5 December 2016 when as Mr Speaker might say, “the mistakers had it”. From then through to 22 June 2017, it was a mixed picture but mainly, just in terms of these polling outcomes*, pro Brexit: 6 times pro-Remain, 16 times pro-Leave. It was tight and over the full set of polls, 7 are ‘tied’ between saying that ‘Britain was wrong’ to vote to leave, and saying it was right to do so. But since 11 July this year when the ‘Leavers had it’, the ‘Remainers’ have won every poll, indicating that by a small margin, Britain is now against Brexit . Of course this is not what the Brexit camp, which nominally includes the Government, want to hear. So as Brexit grinds along in fits and starts, pro-Brexit British politicians, and even some pro Remain politicians who fear the electoral consequences of saying otherwise, constantly repeat the mantra that politicians must accept “the will of the people”, meaning the narrow Leave EU Referendum result. Thus although that Referendum was not binding but only advisory, and ‘the will of the people’ does appear to have changed, it gets largely ignored. Both Labour (which is oh-so-gradually shifting away from Brexit) and Conservatives want to ‘move on’ and the media are largely complicit in this, as they largely must be on a story where the content and all the drama is made by political infighting and manouevers. So this poll and similar ones get little attention. For the time being. For the benefit of any readers outside the UK, and for UK readers who understandably do not follow Brexit in any detail, most of that politicking now focuses on what sort of Brexit it might be. The two most debated economic tests of this are whether or not Britain stays in (or sort of in) the Single Market, and in (or sort of in) the Customs Union. Other polls regularly show far greater public support for staying in either or both of these. Consequently many of the more ardent Brexiteers allege that “people knew what they were voting for when they voted Leave” and although neither was mentioned on the ballot paper, that “obviously included” leaving the EU Single Market and the Customs Union. “Otherwise it would ‘not really’ be leaving the EU”. As a media ‘bridging’ device this usually works because journalists normally lack any brief or means to question whether it is true. In other words, there are no (not many accessible) ‘facts’ about what people actually thought they were doing in June 2016. Some play was made after the Referendum with the fact that large numbers of Brits were Googling things like “what is the EU?” immediately after the result was declared, to suggest, in line with much anecdotal experience, that many people voting Leave really had no idea of what was involved. But we can do the same thing with the two issues, now hugely discussed but little mentioned in the campaign before June 23rd 2016, the Single Market and the Customs Union. The Single Market and Customs Union are, to be honest, quite techy topics. So if these were issues which the voters were really exercised about and giving a lot of thought to, the natural time to do this would have been before the Referendum. We can’t read their minds but we can look at Google trends for the UK. Above: UK Google search trend Dec 2012 – Dec 2017, Single Market (red) and Customs Union (Blue). Here’s what we find. Very few searches until June 2016. A lot more since the Referendum. It seems something happened which made people want to know more. Here’s the results from 20 February 2016, when the announcement of the Referendum was made to date. It looks like there was not that much interest in the Single Market or Customs Union before the Referendum? Let’s take a closer look. Here we can see that there was a slight rise on polling day but a massive one afterwards. It’s pretty clear what happened. The huge political and media discussion which ensued, and in which the Customs Union and Single Market have featured prominently, stimulated people to want to know more. Only too late to inform their views on 23rd June 2016. The claim that most people voting Leave ‘knew’ it ‘meant’ leaving the Single Market or Customs Union (or quite probably, knew anything about them) is, to use Boris Johnson language, piffle and balderdash. So how did people decide to vote? Some undoubtedly did put a lot of effort into researching the pro’s and cons, including some who voted Remain and some who voted Leave but not many of them (and perhaps some of the current ‘don’t knows’ and the nearly 30% who did not vote at all but probably even less of them). Most of them will have decided on a ‘Track One’ basis: what felt right. A recent post A Two-Track Tool For Issues Development and Campaign Design argued that society operates on two ‘tracks’, differentiated by whether Kahneman’s ‘System 1’ (intuitive, emotional, reflexive, unconscious, automatic, easy) decision making is dominant, or ‘System 2’, the conscious, ‘effortful’, analytical, reflective way of making decisions. 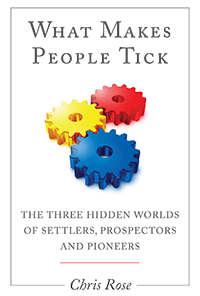 On a technical political issue of huge complexity like staying in or leaving the EU, Track Two discussions would have been severely limited to policy communities, political scientists, economists, a thin slice of political nerds and geeks, businesses with a particular interest, and MPs who had specialised in the area for decades. These people frequently appeared in the media (especially after the result) but their arguments would have been of almost no interest to most of the ‘general public’ (unlike topics like immigration or money for the NHS). If you look at it in these terms, Remain fought a much more Track Two campaign than Leave, and lost. On Track One, System 1 gives us what Kahneman described as ‘a way of jumping to conclusions’. Plus if something is hard to weigh up and difficult to grapple with – as many people reported about the arguments pro- and anti- ‘Brexit’), if there’s an easier option on offer, we take it (what he calls, substitution – use System 1 instead). 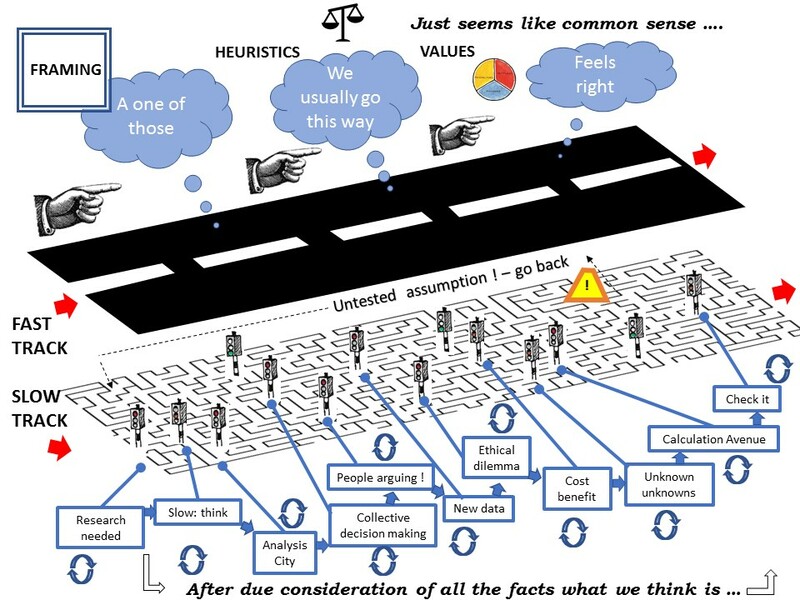 Hence, framing, heuristics (mental shortcuts) and unconscious motivational values come into play. As I showed in previous blogs on Brexit eg The Values Story of the Brexit Split (Part 1), “Oh Jeremy Corbyn” – Will You Chose The Old or The Young ?, and Brexit Values Story Part 2.1), values explain the Referendum result more clearly than any other analytical tools. Above: example of the Track-One-Track-Two differences. See also this subsequent blog for how it played out in the plastics issue: Why We Suddenly Have a Plastics Crisis. The claims and counter claims are confusing and I can’t be bothered trying to research it. So the easiest way to answer nice Mr or Ms YouGov is by reference to how I voted in the Referendum. That’s the ‘consistency’ effect (I was sane then, and still am, so it must have made sense). Then there’s social proof. Most people I know voted this way, and so it was the right thing to do. These will also apply to people who did not vote but who mentally reference others whose opinions they tend to agree with. All this anchors opinion around the 50/50 split. Those few percent already drifting off to say yes it was a mistake, may well be those whose personal experiences (eg through business), or subsequent research (not many of them) on Track Two, have led them to change their minds. That’s with a question framed about how Britain voted. Questions about other aspects of Brexit such as ‘should we have another Referendum?’ (lots of agreement) or ‘is the government doing a good job in the negotiations?’, do not have any anchoring effect and so opinion is much more labile. And because of course they never took a view on the Single Market or Customs Union, there is also a lot of support for staying in both or either, even amongst those who voted Leave. What might make a big difference to the YouGov polls? If there was some Track One type evidence, salient, simple, easy to process, definitive looking, which made Brexit feel bad, and if there was an obvious alternative. Which is why it is still the case that if the Labour Party clearly came out against leaving the EU, providing ‘some else’ to take care of (think about) things**, public opinion would very probably start to change rapidly. ** I’ve been asked to clarify this. It’s that if there was a clear different option, giving a ‘real choice’ which registered on the Leave-Remain spectrum, rather than Labour offering a ‘shade of’ the Conservative Brexit, this would simplify the choice-making to something like ‘who do I follow’ (using System 1) as opposed to trying to do an analysis and then asking which option comes closest to it (using System 2 and then making a choice). Hence the creation of the clearly different ‘Labour Remain Option’ would itself facilitate substitution. Plus because of the numbers of MPs in Parliament, it is only the Labour Party which could make this happen, which a lot of people will be at least dimly aware of, and so long as Labour does not do it, there is no ‘moment’ to provoke re-appraisal.